Airwheel has unveiled its new products of artificial intelligence robot S9 and other products of late. The new member of S8 is a stylish two wheel electric walkcar. Airwheel Z5 electric standing scooter considers every detail while the Airwheel C series is the first series of accessories. The past CeBIT 2016 is regarded as Airwheel Technology’s first new products release conference in 2016. They will be introduced one by one. The highlight on CeBIT is the Airwheel S9 two wheeled self-balancing robot, which can avoid the obstacle before it automatically. By means of its built-in intelligent chip, Airwheel S9 wheeled mobile robot can map its route and enable man-machine communication. This inspires a sanguine interpretation that Airwheel Technology will shift its focus on the technology of AI. 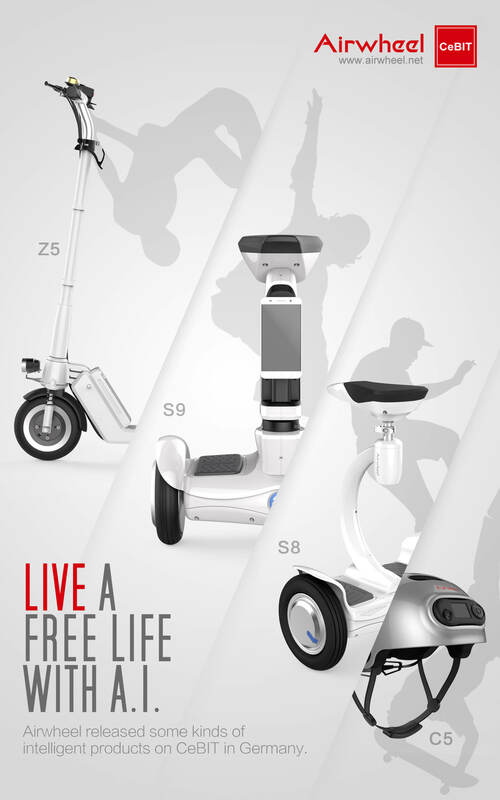 Airwheel S8 sitting-posture electric scooter provides riders with a soft saddle and sit-on and stand-on mode of ride. They are allowed to sit on the ergonomics saddle to take ten when the rider feels tired after a long ride. Although Airwheel S8 two wheel saddle-equipped scooter has no control lever, it is easier to keep balance during the riding, which is rather suitable for beginners and for those who are fond of novel vehicles. Airwheel Z5 standing up electric scooter enables individuals to easily carry it into elevator, subway, bus, or store it in the trunk of a car. With the modular battery design and USB interface, the journey has never been so easy and relaxed. Airwheel C series-smart helmets is the first series of accessories, C3 and C5 included. Both of them can take photos, record data and receive calls during the journey. According to Airwheel, the helmet C3 is suitable for common players whereas Airwheel C5 helmet for Extreme sports is more suitable for those professional players. For more details, you can learn from http://www.airwheel.net. Previous：Airwheel S8 two wheel electric walkcar wins not only from externality.